Designing & Developing an Open Badges Ecosystem – Fredrick W. Baker III, Ph.D.
Purpose: To design and develop an open badge ecosystem for The University of Tampa and create a proof of concept. Results: The badges have generally been well received by stakeholders, although a need to educate the faculty and staff on open badges is still prevalent, and the project has moved into the implementation phase. Some badges have been awarded, and they are starting to become more prominent in graduate orientation and hybrid training areas of the institution. This phase started the general research into Open Badges, benchmarking similar efforts at other institutions, findings in the literature, and learning to articulate what open badges are, how they are useful, and what the differences are between them. This phase involved designing the badge icons, symbol sets, and ecosystem model for UT. We worked with the Public Information department to create symbols that were approved for UT branding, and worked with various entities to create a base set of symbols that covered a variety of concepts. Instructions for use were created, and the system is now extendable to create future badge sets. In this phase all of the badge icon sets were created. Each of the 9 badge shields from Phase II represent a college or department, and each badge can be either academic or non-academic in nature. 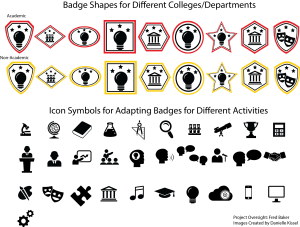 Each badge also has one of 4 levels (0, 1, 2, or 3 stars), and there are currently 31 symbols. Therefore, there are currently 2,232 separate badge images. The design project portion is complete, and has progressed into the implementation phase. Examination and consideration of whether badges fit with the UT culture will determine whether success in the next phase.